What a great evening at the Charity Art Sale for Mind organised by KINC, Kingston Independent Network of Creatives. Thank you to all, artists and patrons, for your support for this important cause. The Grand Opening took place on Thursday 17th of May at All Saints Church in central Kingston, with the Worshipful Mayor of the Royal Borough of Kingston upon Thames in attendance. 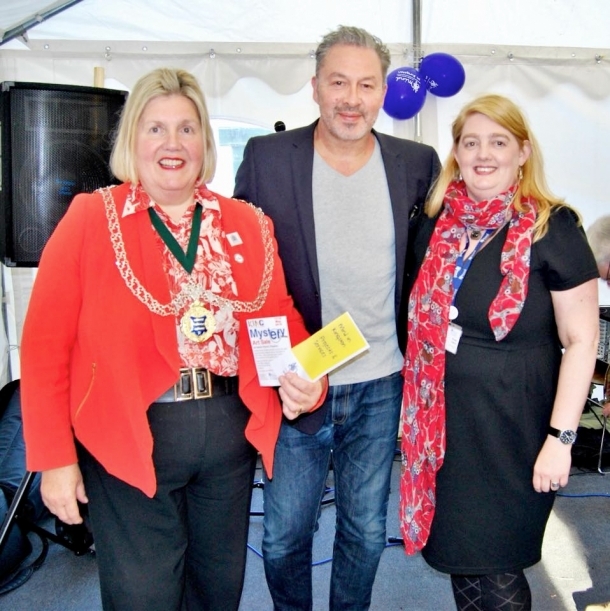 Cass Art sponsored the event on the lawn in front of the historic All Saints Church, where a very merry crowd snapped up the mystery art pieces whilst sipping fizz supplied by Waitrose and Sainsbury's, and swaying to the music of the live band, Eltel. It was altogether a marvellous, successful beginning to the three day event. The Grande Finale is an Art Auction of larger art works at 5pm on Saturday. KINC, including local photographer Paul Mowatt and artist Robin Rutherford, are supporting Mind in Kingston by inviting artists to submit an original work which will be sold anonymously. Each work is priced the same at £35, and no one will know whose work they are buying. It allows people to own original art at the fraction of the gallery price, and also support their local mental health charity. KINC, the Kingston Independent Network of Creatives, raising money for Mind in Kingston with their Mystery Art Sale. The exhibition continues on Friday 18th and Saturday 19th of May. Don't miss the Great Art Auction and Cass Prize Raffle on Saturday afternoon at 5pm!